European researchers have created a robotic hand that may provide amputees with a sense of touch. The new prosthetic is still cumbersome. For one week cords snaked from a bandage on Sorensen’s arm to the artificial hand. Electrodes implanted inside two nerves in the stump of Sorenson’s arm zapped the nerves in proportion to what the sensors detected. Sorenson was able to feel if different objects were hard or soft, slim or round, and intuitively adjust his grasp. The electrodes essentially created a loop that let the robotic hand communicate with Sorenson’s brain so he could feel and react in real time. Without sensory information being fed back into the nervous system, amputees cannot feel what they are trying to grasp and must constantly watch the prosthetic to avoid crushing objects. A few other pilot projects in the U.S. and Europe have made similar attempts, but this new experiment is among the most advanced. Although scientists have made great strides in recent years in improving the dexterity of prosthetics the sense of touch has been a much more difficult challenge and is one reason that many patients don’t use their prosthetic hands as much as they’d like. 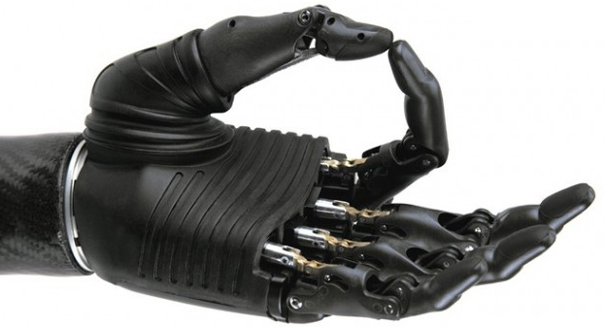 The clinical study provides the first step towards a bionic hand, although a sensory-enhanced prosthetic is years away from being commercially available and the bionic hand of science fiction movies is even further away. It will take years of additional research before an artificial hand that feels becomes a reality, but the research released Wednesday was a major step forward in the effort to create more lifelike and usable prosthetics. The next step involves miniaturizing the sensory feedback electronics for a portable prosthetic. The study is published in the February 5, 2014 edition of Science Translational Medicine, and represents a collaboration called Lifehand 2 between several European universities and hospitals.